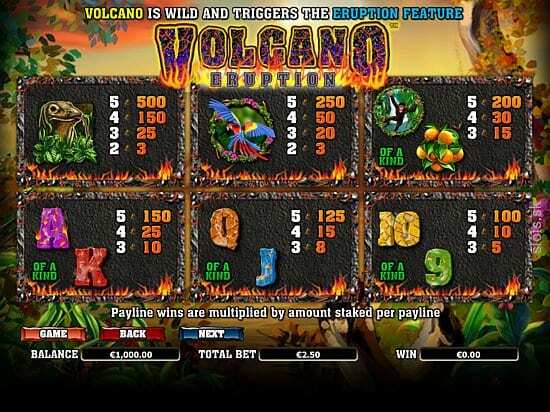 Play our online slot casino - Volcano Eruption today. Manoeuvre your way through explosions of molten lava to achieve great success in this advanced SEVEN reel. 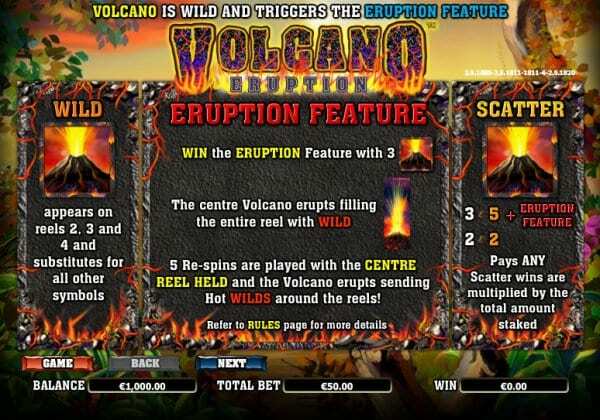 That’s right, 2 additional reels mean more combinations and more chances to win, unlock the ‘Eruption feature’ in this igneous online slot. NextGen Gaming slots always deliver innovative products to the market as the developer team strives for original and creative game design. This company has been founded almost two decades ago and have provided extraordinary entertainment worthy to try and play on some of these slot games, topped with high-quality graphics ever since. With the big list of launched games, NextGen Gaming has become very popular, providing different themed titles and exciting slot games. One of our best games is white wizard slots. Volcano Eruption must be one of the most dangerous video slots around! Everything in this volcanic slot game screams danger, yet you want to stay and admire the beautiful power of nature. It is exciting and adventurous and the art style will immerse you right into this world before dinosaurs got extinct. 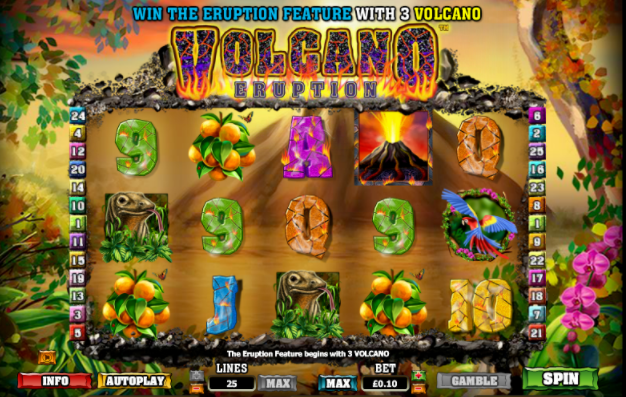 Erupting with hours of fun for you to play within this slot online. In the background of the 5 reels and 3 rows, you will see a beautiful natural landscape and the volcano in the middle. Gorgeous flowers and tree branches decorate the sides of the game and the reels are filled with exotic animals and other symbols. Check the new top 10 best slots now. Besides the low-value symbols A, Q, K, J and 10 you will find delicious fruit, an orangutan, a colourful tropical bird and an already extinct dinosaur. The wild in this game is represented by an erupting volcano and can only be found on reel two, three and four. It will substitute for all other symbols making the chances of a payline in a spin bigger. To try spin and discover the 25 different paylines you will have to bet as little as one penny or up to fifty pounds. And to make your spin even more profitable, adventurous and absolutely exciting the game also offers the Eruption feature. To trigger this feature you will have to land three wild symbols. This will award you with five free spins and during these spins, the entire middle reel will become one large volcano wild. With every spin, you will have the chance to land extra wilds on the remaining reels increasing your winning opportunities massively. The free spins feature cannot be retriggered during this period. If all this danger is not enough for you and you are still looking for an extra adrenaline kick you can always try the gamble feature. Simply click on the “Gamble” button after a win and double or quadruple the amount of your prize if you manage to guess the colour or suit of the next card drawn right. There is a maximum of five correct guesses. This game is full of molten rocks, lava and extinct dinosaurs providing you with an adventurous and exciting gameplay experience. The soundtrack and art style will immerse you into this world of Volcano Eruption. The main feature is perfectly fit into the theme and may make your game very lucrative. If you are looking for a thrilling experience with a nice game feel this video slot is the right option for you. Volcano Eruption offers the perfect opportunity for anyone who loves a little adrenaline and gambling to travel into a long extinct reality of our world. When you've had enough of slots then give blackjack pro.